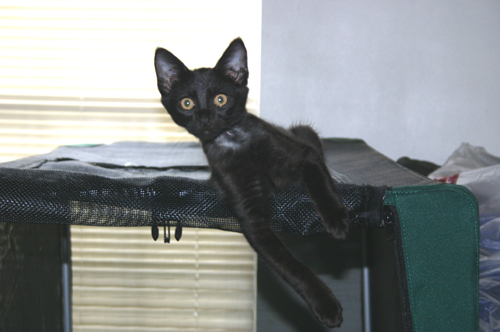 Portrait of the Enforcer as a Young Kitten. This is not too long after I got him home; when I got him he suffered from infected wounds in his neck (hence the shaving) plus two infected ears (with punctured ear drums), and an Upper Respiratory Tract Infection. Also he was incredibly malnourished, such that his body had decided to stop growing fur so it could divert that energy to keeping his organs growing, which meant his hair was a little thin. A kind lady rescued him from a ditch and then I stepped in when her resident cat wanted him dead, hence why I refer to him as a Purebred Sable Tennessee Ditch Cat. Loving the vintage photos! The photo of Tink (yesterday) is just dear, and Braxton is dashing in spite of his rough start.